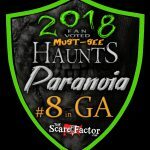 Paranoia Haunted House is a Haunted Attraction located in Canton, GA. Team Jefferson Starship reviewed this attraction on September 29, 2017. 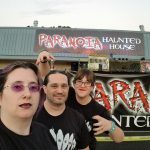 Paranoia Haunted House was our first haunt in Georgia this year and we are glad we got to see it. 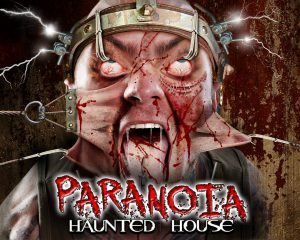 Every year, Paranoia creates a pair of themed haunts ready to elicit screams of terror from its guests, and this year was no different. The frightening Experiment X and creepy Slaughter Shack were this year’s fare, each ready for visitors with a crew of horrors and numerous props and sets on display. We took the time to review each of these great haunts separately, but have averaged the scores between them for simplicity’s sake. We found Experiment X to be slightly better than the Slaughter Shack, but with two great haunts it can be hard to pick a favorite. The only way you can be sure is to give each of them a try for yourself and see where your screams are loudest. The cast of both haunts were a great bunch of monsters, victims, and looming presences in the darkness. In Experiment X, we adored the scientist at the start who gave us the rules of the haunt in character. She was very interactive and had some great dialogue in addition to her rules spiel. There was also an actor who not only popped out in one spot, but also climbed over and around us while we moved through his area. In the Slaughter Shack, the old grandma at the door was a cute addition, and the folks in the dining room were very entertaining. The bus driver at the very end was also great. Both haunts had small clusters of haunters, usually playing off of one another, or being victimized by a local monster. Still, these clusters of haunters were pretty well spaced throughout each of the haunts. The monsters roaming the queue area are very well done – from zombies to stretched out hands. Costumes fit the characters well and were complete. The most detailed masks seemed to be outside in the queue area; this is fairly common for many haunts as it is in these areas that the customers are closest to the creatures for the longest and typically in the best lighting. Here at Paranoia, this is no different. 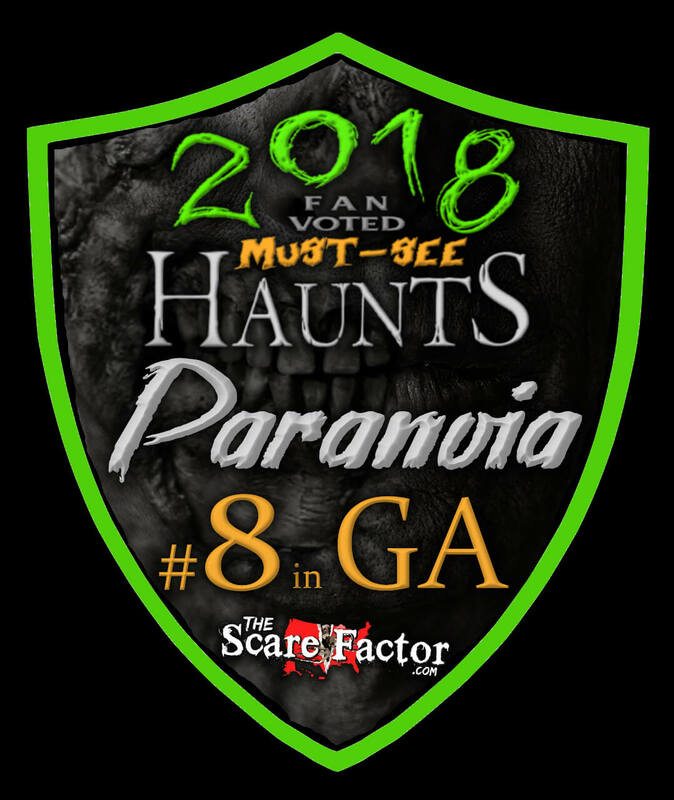 The monsters actually start interacting with the guests before the gates to the haunt open – looming over walls, peering through fences, or delivering a monologue from atop the ticket booth, the monsters of Paranoia are out working to get you in the mood for the terrors you’ll find within. With a bit of attention, you can even see where these queue actors foreshadow scenes and scares inside. Make-up was consistent throughout both haunts and everyone had it on – even the ladies in the merchandise booth! Overall, the Slaughterhouse was more consistent with most of its costuming and make-up. Which is not to say that you won’t find some great examples inside Experiment X; there are plenty of victims and mad scientists and the results of both lurking about. Aside from a wobbly floor effect in the Slaughterhouse that might trip the unwary (and you probably won’t be looking at the floor with the ghouls surrounding you), there are occasionally pieces of the set that you must duck under. These things help with immersion, but could be tricksy for those too scared to pay attention to what’s around them. Outside, there’s some great queue entertainment provided by both music and monsters. The parking lot at Paranoia isn’t the greatest – you may have to park nearby and walk up to the haunt. We can easily see the parking lot being overcrowded on busy nights forcing people to park nearby. The staff are great – non-costumed monsters wear staff shirts and can be a great help. They were a boon to us when we got LOST while INSIDE Experiment X. We got carelessly turned around while trying to navigate out of a mad doctor’s lair and mistakenly thought that his “go on” was an indication of which way to go. Imagine our horror when a staffer had to come and rescue us from behind the walls of the haunt! Still, they were professional and helpful and set us back on the right path, albeit closer to the start than our deviation point. Paranoia knows how to put on a show. We can easily recommend arriving before the gates open. Not only will this ensure that you can nab a parking spot, but it also means you get to see the monsters put on a bit of a show for those brave enough to arrive before nightfall. Monsters, flames, music, countdowns, and sneak peeks are waiting before the gates even open and once they do open, visitors are readily prepared to meet the architects of their doom. 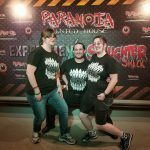 The crew at Paranoia put in a great deal of work on the effects of their haunt; so much so that some of the subtleties might be lost. While not overwhelming, there are some loud effects inside Experiment X. However, these are done so well that there’s very little bleed over of the sounds into other parts of the haunt or even outside. Some rooms had more details or effects, and overall Experiment X had a slight edge here over the Slaughter Shack even with its creeky floors. Some things in Experiment X are enough to make you lose your head – like one of the victims inside. Paranoia contains two haunts, each with a different theme. Both of these start off fairly recognizable – and if you couldn’t tell, then a well-informed victim-to-be or former accomplice will quickly fill you in on the theme while delivering the rules for the haunt. While both haunts have some minor internal issues with their own themes, overall they do a good job of grabbing one thing and sticking to it. The staff of Paranoia develop their own scenes and characters, so you’re not likely to find anything quite like it elsewhere. The location in the midst of a busy street doesn’t entirely help with the ambiance outside, but once you’re within the walls of Paranoia, no matter which haunt you pick, you’ll soon forget about what lies outside. Paranoia brings a variety of scares to its guests. Between a variety of animatronics and trained actors, there’s something to startle the screams from nearly anyone. Built in pauses in the action will keep you guessing as to where the next scream is coming from. 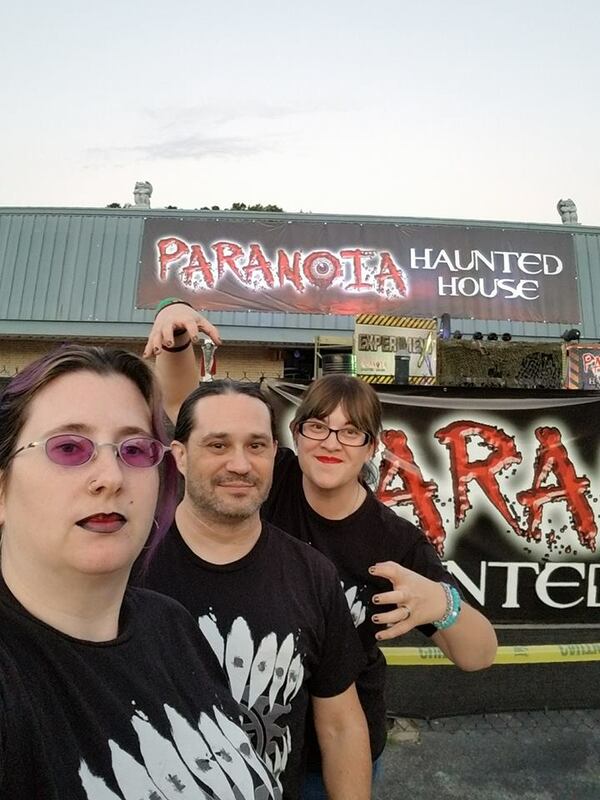 Paranoia is a great haunt to visit. We were able to move through Experiment X and Slaughter Shack in about 12 minutes time each (not counting our little bit of getting lost) and some of the pauses built in. 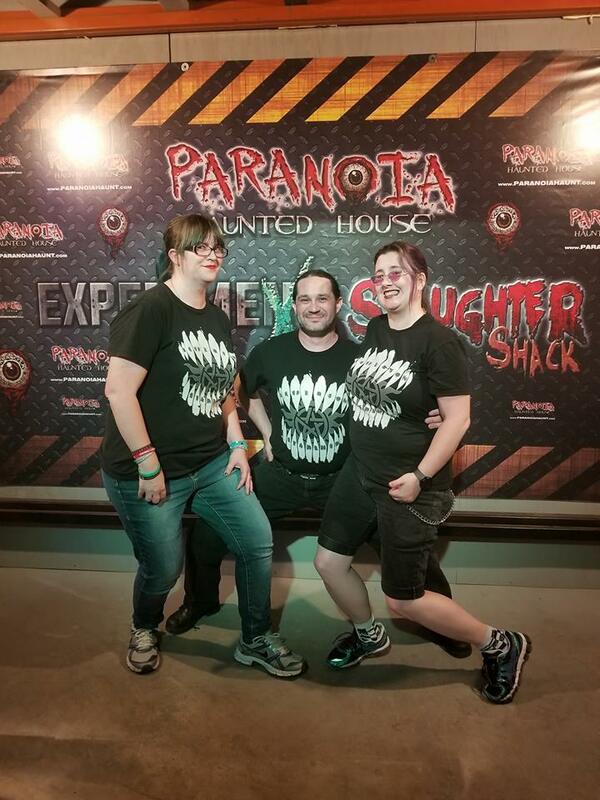 Since visiting the Slaughter Shack is only $5 more than a ticket to visit Experiment X, we have to recommend buying a combo ticket and hitting both of the attractions in order to both maximize your entertainment dollar and to get in the most screams. There’s probably not much space that’s not utilized inside (and out) of Paranoia, but we’d like to see this haunt grow and expand in the future.